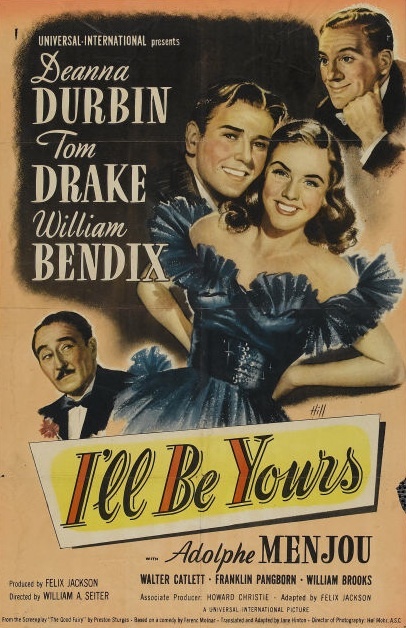 I really liked I’ll Be Yours, and not just because it stars my time-travel girlfriend, Deanna Durbin. It’s a light and frothy romantic comedy — hardly my favorite genre — but the performers are appealing, the humor is genuinely funny, and the musical numbers are great. I imagine that Durbin’s negative assessment of her last several films was at least partly due to her dissatisfaction with Hollywood. If she was yearning for a “normal” life and looking for a sign that she should continue acting, I’ll Be Yours is neither groundbreaking nor artful enough to qualify. But if you’re a fan of Deanna Durbin, I’ll Be Yours is wonderful entertainment. She’s as lovely and appealing in it as she was in everything else, and her singing voice was unparalleled among Hollywood ingenues. In I’ll Be Yours, Durbin plays a naive, wide-eyed young woman with the unwieldy name of Louise Ginglebusher who leaves her hometown of Cobleskill, NY, for a life of excitement in Fun City. While eating lunch on a ridiculously tight budget, she’s befriended by a cranky but kindhearted waiter named Wechsberg (played by William Bendix, another performer who was able to overcome mediocre material). She’s given a job as an usherette in a palatial movie house by a fellow native of Cobleskill, Mr. Buckingham (Walter Catlett), and shown kindness by a young and handsome lawyer named George Prescott (Tom Drake) who sports an unfortunate Van Dyke beard. After Wechsberg sneaks Louise into a swanky party he’s working at the Savoy Ritz, she’s snookered into performing a musical number by a philandering millionaire named J. Conrad Nelson (Adolphe Menjou). Naturally, she pulls it off with aplomb, and the song she sings — “Granada” — is a high point of the film. This leads to J. Conrad Nelson offering Louise a starring role in the Broadway musical he’s financing, but to fend off his advances she invents a husband for herself. In doing so, she underestimates the tenacity of Nelson’s libido. Nelson demands to know who her husband is so he can be put on his payroll and eventually be bought off and done away with. Forced to produce a husband, Louise turns to Prescott, but his old-man beard will have to go. All of this is ridiculous, of course, but it’s a thoroughly entertaining vehicle for a quartet of appealing performers. And the music is wonderful. Felix Jackson wrote the script, which was adapted from Preston Sturges’s The Good Fairy (1935), which was based on a play by Ferenc Molnár. William A. Seiter directed the film. Posted in 1947, February 1947 and tagged Adolphe Menjou, Comedy, Deanna Durbin, Felix Jackson, Ferenc Molnár, Frank Skinner, Franklin Pangborn, Hal Mohr, Howard Christie, I'll Be Yours, Jane Hinton, Joan Shawlee, John Phillips, Musicals, Otto Ludwig, Preston Sturges, Romance, Tom Drake, Universal Pictures, Walter Catlett, William A. Seiter, William Bendix, William Trenk. Bookmark the permalink.